Switch off your electricity to the geyser with the switch on your distribution board. Let your hot water taps run for a few minutes to relieve some pressure from your burst geyser. Turn off your water supply at your mains. When there is very high temperatures or pressure in the geyser which is more than it can handle. Due to a lack of maintenance, a geyser’s pressure vessel can fail because of corrosion build up inside of the geyser. If the quality of the materials used to maintain the geyser is not on standard, therefore can lead to a burst geyser. Maintenance, especially from a qualified Guru plumber every once in a while can prolong your geysers lifespan. Wrap your geyser in a blanket during cold seasons which will also save you money and energy. Use a drip tray and be sure the outlet pipe flushes away most of the water in case of a burst geyser to prevent property damage. In case of a burst geyser, contact Solar Guru who provides qualified plumbers to assist you. But it’s not all bad because you can consider installing a solar geyser which will save you more money and which also comes with a 5 year manufacturer warranty. Eskom struggles but you don’t need to. Never go without hot water again when converting your existing geyser to a solar geyser. During load shedding, you can have peace of mind when you require hot water and the best of all, it doesn’t have the expense! With Solar Guru being a solar geyser installer, we can help you out in no time. We offer cost effective solar geyser conversions to save you even more. 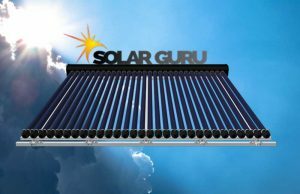 Solar Guru is a leading and trusted solar geyser installer and supplier.